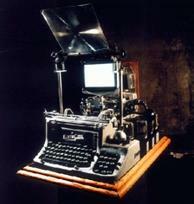 Andrew Leman combined a 1988 Macintosh computer, a 1923 Underwood typewriter, and an armful of other parts to create the ElectriClerk – a diabolical thinking-machine that will surely spell the doom of civilization! “Built for a game of Cthulhu Lives! that has yet to be played, this piece was inspired by the retro-futuristic machines in the movie Brazil by Terry Gilliam. It was one of the most difficult and time-consuming pieces I’ve ever attempted. Effing brillant. And the stuff that lies beyond that “Cthulhu Lives!” link is overloading my H.P. Lovecraft-loving circuits. ← Pandora, squeezing out "Sparks"